Can I just say how much it blows my mind that I’m growing food in my backyard? …which isn’t even really a backyard, but just some planters on the patio. Normally, I just grow herbs, mostly mint because it’s super-easy. You can neglect mint and it will still forgive you after a splash of water and sunlight. And as much as I like using herbs in cooking and cocktails, to be honest, it’s just nice to have greenery constantly sprouting forth either inside or outside. But I’ve never been amazing with plants. I’ve discovered hacks over the years–self-watering pots, the most recent–which allowed me to be my usual non-green-thumb-having self. 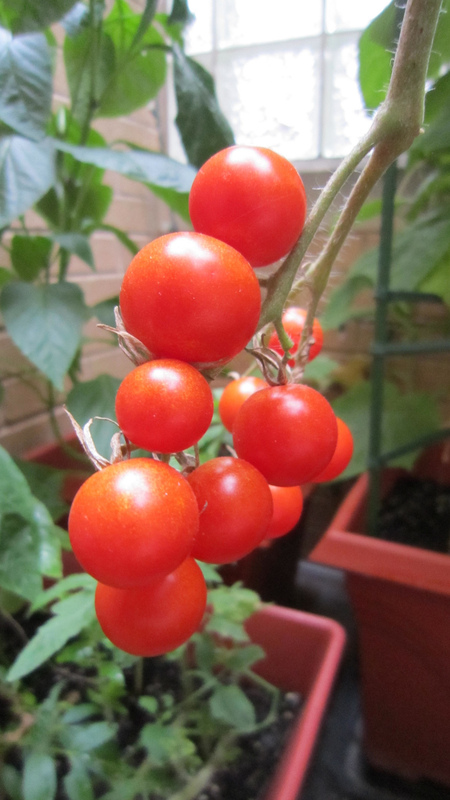 Still, after observing the boy’s balcony garden which absolutely flourishes, I thought… let’s give it a shot. Thankfully, he started growing from seed the right way, indoors, multiple seeds, and chose the best for his garden giving me the second best plants. I got some self-watering planters, cages and went to it. I have food. Cherry tomatoes are looking amazing and while I thought I’d be lucky to get a single cucumber from the plant, it’s growing strong and while the above picture is from a few days ago, I’ve got two more just about ready to harvest. It’s fantastic and I did what any geek would do… I took pictures! Sliced up and tossed with a quick dijon vinaigrette, that is…: 1 tablespoon dijon mustard, 2 tablespoons vinegar (red wine, cider, white, to your taste), an optional teaspoon to tablespoon minced garlic, or other chopped/dried herb added to 1/2 cup extra-virgin olive oil with salt and pepper to taste, then whisked or shaken in a sealed container. Knowing what I know now, I’ll be even better prepared next year. Mostly I’ll be starting much earlier. 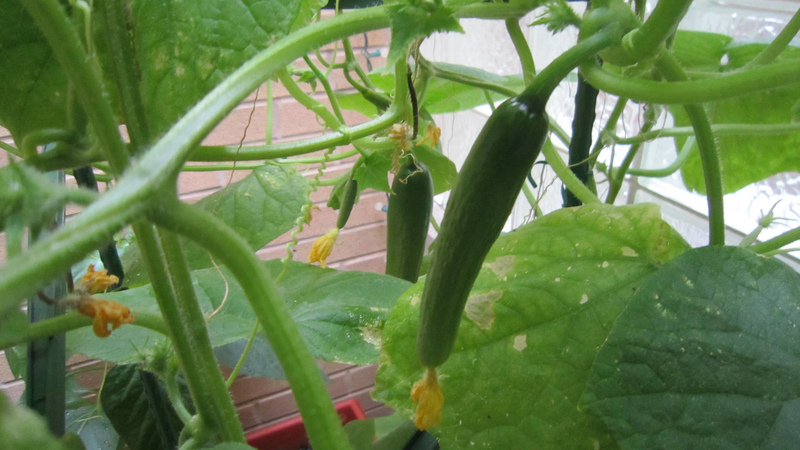 It’s taken about 4 months for my cucumbers to really get going and I have pepper plants that haven’t done anything aside from grow large and lush leaves with no flowers. But honestly, even when it’s just a mint or basil plant from the supermarket aisle, being able to point at something that produces food and say “I helped make that happen!” is fun and satisfying. 1 Not a euphemism… this time. Next story books: Pure Imagin–OMG…!